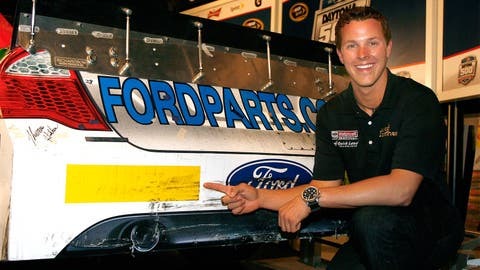 Trevor Bayne points to his rookie stripe after becoming the youngest driver to win the Daytona 500 at the Daytona International Museum during the car induction ceremonies on February 21, 2011, Daytona Beach, Florida. We have a tremendous Rookie of the Year class this coming season headlined by Austin Dillon and Kyle Larson. I’ve had experience working with a rookie driver, when owner Jack Roush asked me to work with Kurt Busch. As a crew chief through this first season, you want to try and keep the rookie driving within his own abilities. This is just the beginning for him. He has to realize that this is a marathon and not a sprint. I think some of these rookies want to go out there and beat Jimmie Johnson or Kyle Busch right out of the box to prove their worth. I’m sorry; they just aren’t ready to do that. That old cliche of ‘learning to walk before you can run’ fits perfectly. It’s one step at a time with these young men. You can’t even let them get caught up in trying to beat records that others rookies might have set. They have to understand they need seat time. They need to run all the laps and learn. It does them zero good to race to the front and then be sitting in the garage with a wrecked race car on Lap 32. To me, the key in being a successful rookie driver is not trying to be something you aren’t. A crew chief has to drill it into them that they simply aren’t the same person they will be in a couple of years. Rookies make mistakes. That goes hand in hand with being a rookie and having that yellow bumper. They’ll get better but this is the first day of the real world in stock car racing and it’s going to take time. I don’t care if you’ve been an ARCA, Camping World Truck Series or Nationwide Series champion. It’s simply not the same world. The NASCAR Sprint Cup series is the best of the best. It’s a whole different animal than what you’ve been used to. Just like moving from college football to the NFL, they play at a totally different level. These rookie drivers have to learn how to elevate their game. They have to mentally be ready to accept the role of what I call ‘The Sponge.’ Listen to what your crew chief, car chief, engineer and teammates are telling you. Don’t get all wrapped up in the fallacy that it is a sign of weakness to ask questions or ask for help. Everyone was a rookie at one point in their career. Everyone had that yellow bumper. Go ask questions of the veteran drivers. If you are willing to do that, you will accelerate your learning curve at a much greater pace. Trust me, in the long run, if they do that, they will be a much happier race car driver. When a crew chief puts together his crew to support the rookie driver, he also has to manage their expectations. They are all smart enough to realize it but the crew chief is responsible for reminding them to anticipate many wrecked race cars in the coming season. Everyone has to be prepared for that, not only mentally, but also from a logistical standpoint of having cars ready. You anticipate the worst with a rookie driver. You tell your guys they may see the rookie wreck 50 percent of the time this coming season. You hope that’s not the case and pray for the best, but you have to anticipate the worst, especially early on in the season. I’ll leave you with another cliche that also fits perfectly into this scenario: ‘Patience is a virtue.’ Across the board, from the sponsors, to the car owner, to the fans, to your race team and yes even to the crew chief, patience is the key to this first season with a rookie driver behind the wheel.